What is Victoria Sponge Cake? 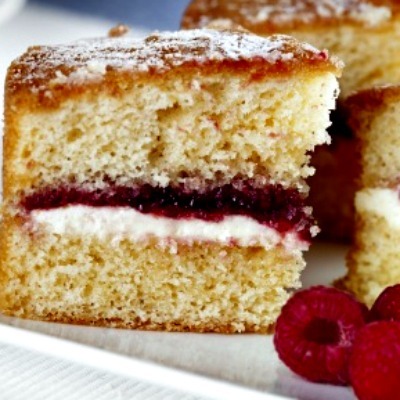 Victoria sponge cake is a light and simple, famously used during the Victorian era tea time. It is similar to sponge cake: white colored, firm structure and evident aeration. However, typically more fat is used than in a classic sponge cake, making it not as rigid or airy. It falls into the category of plain cakes.1 The traditional Victoria sponge, or Victoria sandwich, is a double round cake, with a center of jam and cream or custard. Rather than frosted, the top is sprinkled with caster or powdered sugar. The most concurred credit to the cake’s creation goes to Anna Maria Stanhope, The Duchess of Bedford and Lady in Waiting to Queen Victoria in the mid-18th Century. The Queen asked for tea and cake in the late afternoon, so the Duchess made this “sandwich” cake for her. It is said the cake was a favorite of the Queen and was served it at all her lunches. However, it was also used at tea as a treat specifically made for children. Other tea-time cakes with nuts and seeds were considered unsafe for little ones. Victoria sponge cake soon became the popular choice for both adults and children during Victorian high tea. Over the years, the cake has spread around the world and picked up variations. Victorian sponge cakes have a reputation for being extremely sensitive to cooking times and temperatures. So pay close attention to detail and every step of the baking process. To start, make sure all the ingredients are at room temperature. The cake can then be mixed in two methods. Traditionally, the creaming method is used. Butter and sugar are mixed together until the batter is light and fluffy, before adding in the egg and slowly adding the dry ingredients last. For a more stable batter, increase its viscosity and make sure bubbles are the same size. The one bowl method mixes all ingredients together at once until the batter is creamy. This usually calls for an extra rising-agent, while some recipes require extra soft butter. While jam and cream are the traditional filling, other fillings that could be used are: fresh cream and strawberries, lemon curd and clotted creams or flavored butter creams. Preheat the oven to 190°C/170°C Fan/Gas 5. Lightly grease and flour two 20cm/8in loose-bottomed sponge tins, at least 4cm/1½in deep. Line the bases with baking parchment. Beat together the butter, caster sugar and a pinch of salt until pale and creamy. Gently whisk the eggs in a small bowl and then add them, a little at a time, to the creamed butter mixture. Add the vanilla and fold in the flour. Divide the mixture between the two prepared tins. Bake for 25-30 minutes until well-risen and golden-brown on top. Remove from the oven and turn the cakes out onto a wire cooling rack. Peel off the baking parchment and leave to cool completely. Meanwhile, make the jam. Tip 500g/1lb 2oz of the raspberries, the sugar and lemon juice into a large heavy-bottomed pan and stir over a moderate heat for 2-3 minutes, or until the sugar has dissolved. Turn up the heat and boil for 5 minutes – this is an ‘instant jam’ so you don’t have to check for setting point. Remove from the heat, pour into a tray and set aside to cool. Whip the double cream and put in a piping bag. Place one of the sponges on a plate or cake stand and spread with the jam. Pipe the cream on top of the jam and put the remaining raspberries on top. Place the second sponge on top and dust with icing sugar. 1. Man, C. M. D., and A. A. Jones. Shelf Life Evaluation of Foods. London: Blackie Academic, 1994.